Flags in front of the Kansas City, Kansas City Hall. "The hate and anti-police speech has got to stop because the consequences are real — our blue line just got a little thinner yesterday." Zeigler said he believes there are no suspects at large, but he encouraged people to share information if they have it. He said the investigation would be kept open. Choking up between sentences, the chief said his department had come too far to let the second police killing in as many months destroy the trust it has worked so hard to build with their communities. "Our department is hurting," he said. "But make no mistake, officers of the Kansas City, Kansas Police Department will continue to fight for the safety of the community ... we are not going to go back on the years of work we've done." At 1:39 p.m., another officer spotted the vehicle in the area of 1500 Rowland. 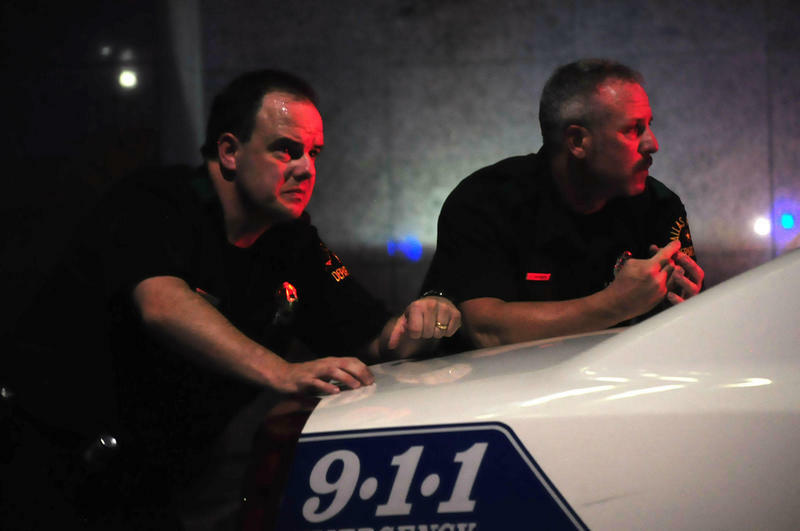 The officer provided descriptions of suspects who ran from the vehicle. He took the driver into custody without incident. At 1:58 p.m., Captain Melton spotted the second suspect in the car around 22nd and Georgia. He proceeded to cut off the vehicle with his patrol car. The suspect got out of his car and shot several rounds into the rolled down passenger window of Melton's car. Captain Melton was shot several times. Officers immediately administered aid. Melton "ended his watch" at approximately 2:55 p.m. at K.U. Hospital. 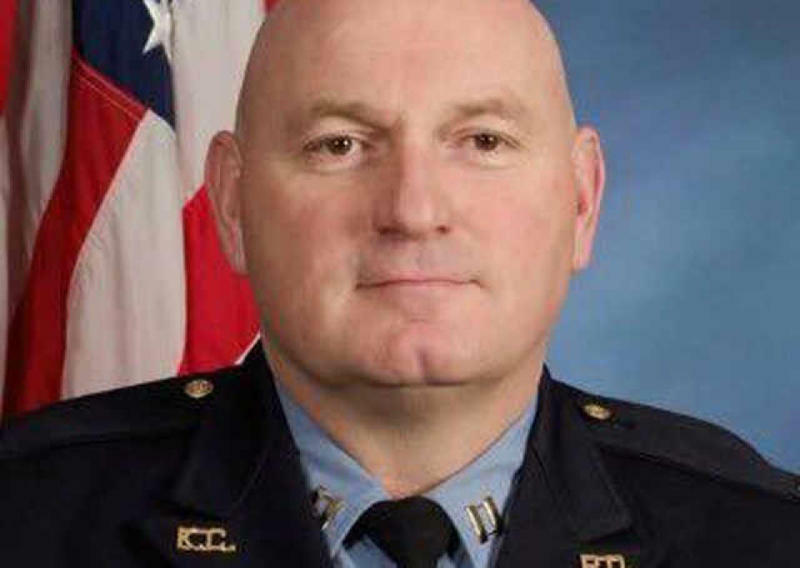 According to the biography released by the police department, Captain Robert D.Melton was a 1988 graduate of Fairfield High School in Langdon, Kansas. He has a B.A. from the MidAmerica Nazarene University in Olathe and was a decorated veteran of the Iraq and Afghanistan wars. There will be a candlelight vigil Wednesday night in front of the Kansas City, Kansas City Hall at 8 p.m.
Laura Ziegler is community engagement reporter and producer at KCUR 89.3. You can reach her on Twitter @laurazig or at lauraz@kcur.org. For the second time in two months, a Kansas City, Kansas, police officer was killed in the line of duty. He died Tuesday just before 3:00 p.m. at KU Hospital. The officer was identified as Capt. Robert Melton. After a deadly night for police officers in Dallas, a frustrated Sly James addressed reporters at Union Station Friday morning. William Conway. Charles Luken. Frank Rohrback. Maurice Bedell. Wesley Walden. Thomas Medina. James Reynolds. An emotional Rick Whitby, president emeritus of FOP Lodge 40, shared personal stories about two of the fallen deputies. Whitby said he was the last to talk to Reynolds before he died in 1984.